Barcelona have raced into a 2-0 lead with two goals in the space of a minute from Ousmane Dembele – both set up by Lionel Messi. Going into tonight’s Copa del Rey game against Levante trailing 2-1 from the first leg, Barca now lea 3-2 on aggregate after a fine start at the Nou Camp. Watch below as Messi punished some slack Levante defending to play Dembele in for the first goal. 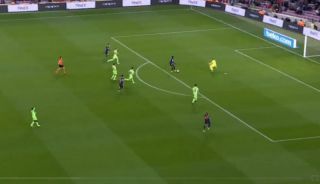 And see this video as well as Messi got involved again, playing a neat through-ball into his team-mate’s path as he rounded the goalkeeper to bag his and his club’s second. You’d fancy Barca to go on and win from here – was it ever really in doubt?